What do questions like “What are my parents hiding from me?”, “What has been making life difficult at the nudist colony?”, and “What would grandma find disturbing, yet oddly charming?” have in common? 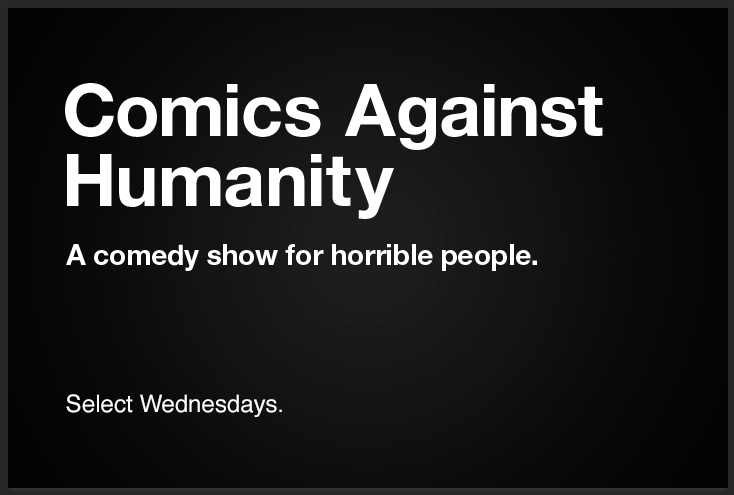 They’re all potential jokes that can be heard on our brand-new show, Comics Against Humanity! A show that brings the beloved and horribly amazing game “Cards Against Humanity” to life! Watch as the best local comedians improvise their sets on the spot using cards from the game as inspiration! To purchase, select the “Dinner & Show for Two” ticket type. Each package includes 2 tickets. Pairs wishing to be seated together should contact our box office. No “Dinner & Show” group seated together may exceed 6 guests.